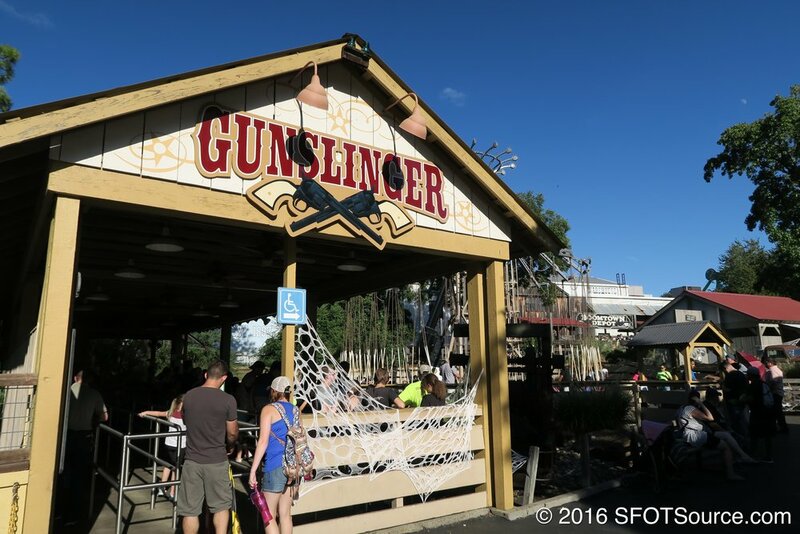 Gunslinger has gone through a few different transformations and location changes over the year. When it opened, Gunslinger called Goodtimes Square home. In 1989, to make room for Flashback! (now the location of The Riddler Revenge), the ride was moved into the Boomtown section of the park. In 2006, Six Flags Over Texas inherited some large gun props from the closed AstroWorld park in Houston, TX. The park made great use of these, putting them around the base of Gunslinger. The ride was repainted and renamed during this transformation. Pictured above is AstroWorld's Yo-Yo when it was still in operation. Texas Tornado is relocated to Boomtown, leaving Goodtimes Square. Texas Tornado is repainted tan and silver and is renamed Gunslinger. Large guns, originally located at the defunct AstroWorld, are placed around the ride’s base. A look at the progress of Texas Tornado being re-themed to Gunslinger. A new queue area and entrance is also coming to the Spongebob Squarepants 4D attraction.